Evolutive premises to match your requirements and projects. 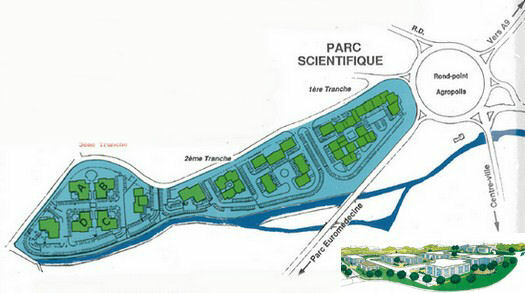 Location: In an unspoilt natural and quiet environment, with easy car park, the science park is next to the La Valette and Baillarguet campuses where numerous public research and training institutes that are members of Agropolis International are hosted; Agropolis International, a world center for agriculture, food and environmental sciences, gathers the most important European scientific community in the fields of agriculture, food, biodiversity and environment including 2 700 researchers and teaching staff. Research for development in agricultural and tree biodiversity. Its mission is to deliver scientific evidence, management practices and policy options to use and safeguard agricultural and tree biodiversity to attain sustainable global food and nutrition security. Montpellier’s office hosts the program ‘basic foods for a better life’ which studies banana and also cacao and coconut. Joint research unit -CIRAD, INRA and Montpellier SupAgro- focusing on the genetic improvement of tropical and Mediterranean plants. The unit endeavours to create the most suitable planting material for farming systems involving the main 20 tropical and Mediterranean species. That conducts basic research on plants and plant communities with the aim of predicting ecosystems responses to environmental forcing, in terms of the distribution/conservation of species and biodiversity, crop production, carbon storage in plant biomass, protection of the environment and the provision of ecosystem services. CIRAD Internal Research Unit that conducts functional agro-ecology research and places its expertise at the disposal of the drive to innovate in partnership so as to improve the environmental, economic and social sustainability of banana and pineapple cropping systems; it aims to support the agro-ecological transition away from intensive monocultures (banana, pineapple), and to contribute to the emergence of resilient cropping systems that perform better in agronomic terms, so as to help ensure food security in southern countries (plantain bananas). The National Mediterranean Botanical Conservatory of Porquerolles Under the authority of the Ministry of Environment, the Conservatory is responsible for the conservation of the Mediterranean plant varieties and species in partnership with a network of scientists. It manages a seed bank of over 2000 species of plants. GIP Pulvés Public interest group created to lead and coordinate actions related to the mandatory inspection of sprayers in France (for phytosanitary products). The institute operates in over 40 countries in Africa, Latin America, the Caribbean and, more recently, South East Asia and Europe. Joint research unit –IRD, Univ. Paul Valéry of Montpellier- analyses the dynamics of societies’ relationships to their environment, as well as policies and mechanisms intended to modify the management of regions and their resources with a view to environmental protection, using a multidisciplinary approach focusing on social sciences (geography, economics, socio-anthropology, law, ethnobiology, etc.). IRD Editions Publishing department – Main issues: environmental changes, biodiversity, living resources, health, social, economic, cultural issues related to development. More than 1500 references. Oenobrands Designs and markets the oenological allowing the creation of solutions that provide an integrated answer for both the ambitions and desires of the winemakers, traders and consumers. It develops a range of oenological products including enzymes, yeast, yeast-derived products and bacteria. PalmElit Planting material solutions for the tropics - PalmElit proposes selected varieties of very high-yielding oil palms adapted to local conditions. Racines Racines offers a range of food products throughout the world, meeting popular demand from African and Indian Ocean communities. Valorhiz Incubated in Montpellier, Valorhiz specializes in design, supply and implementation of innovative solutions for functional diagnosis, biological treatment and monitoring of soils. The solutions (devices, products, processes, tools for Decision Support) are designed for land reclamation, revegetation of disturbed soils, reconstruction of bio-Technosols, sustainable agriculture, treatment of green spaces, management and rehabilitation of contaminated soils.